Click on Tools > myHEALTHware > Configure. Invite staff members (SOAPware users) to join myHEALThware and be connected to the clinic's organization and assign a role to the staff members myHEALTHware account. 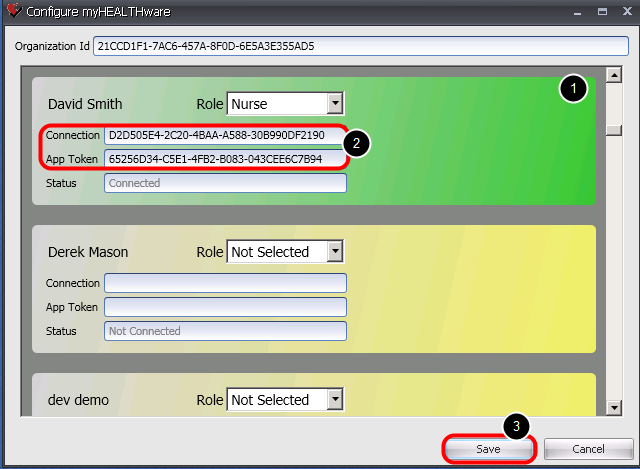 Remove the myHEALTHware connection of a staff member (may need to be done when a staff member is no longer employed by the clinic or in various other situations). 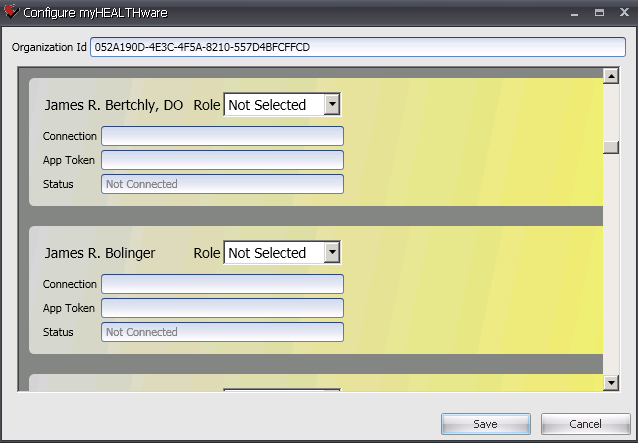 Locate the staff member's name in the Configure myHEALTHware dialog. 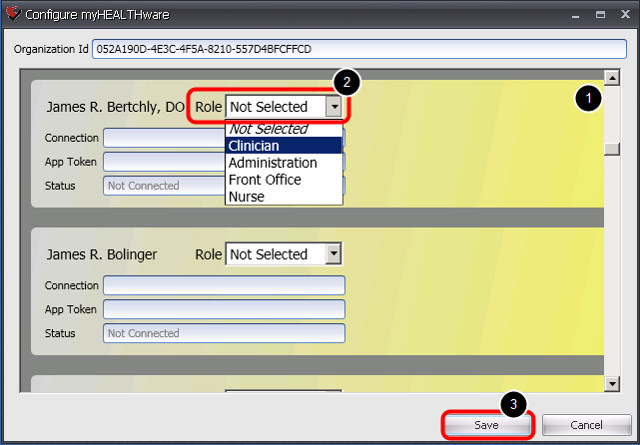 Using the drop down menu, select the staff members myHEALTHware role. Repeat steps 1 & 2 to send myHEALTHware invitations to additional staff members. Instruct the staff member to log in to SOAPware and complete the myHEALTHware Set Up wizard. *Note: Staff members can be invited to join myHEALTHware using the myHEALTHware Organization Set Up wizard upon initial Organization set up. If new staff members are added after the set up wizard has been completed, the above process can be used to invite and connect them with you myHEALTHware clinic organization. Highlight and delete the code that is listed in both the Connection and App Token field. Deleting these codes will remove the staff members connection to your myHEALTHware organization through SOAPware only. Follow the next step to remove the staff members connection to your organization. Click on the Connections tab located in the My Health panel. Locate the staff member that you wish to be removed from your organization. Hover over the staff members name, then click the X button to remove their connection. Click the Confirm button to delete the staff members connection to your organization.